Heat fresh chicken stock or vegetable stock in a saucepan to a gentle simmer. Heat olive oil and half the butter in a heavy-bottomed saucepan. Fry onion and bay leaves for 3-4 minutes until fragrant or softened. Add the rice and stir to coat the grains well with the fat. Add mushrooms and fry for 4-5 minutes. Pour in wine and boil, stirring until absorbed. Add a ladleful of simmering stock. Stir until absorbed then continue to add the remaining stock by the ladleful, stirring until the rice is tender but still retains some bite. Stir in remaining butter and add grated Parmesan. Season to taste and take off the heat. 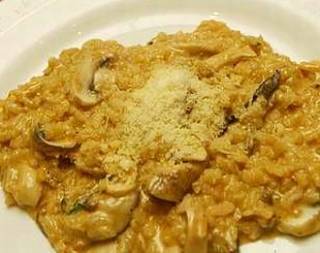 Cover the saucepan and leave risotto to stand for 3-4 minutes. Dish out and serve with a sprinkling of chopped parsley.